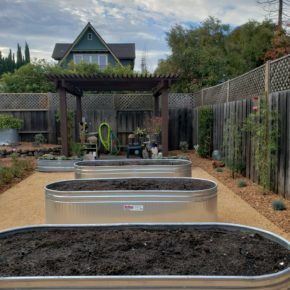 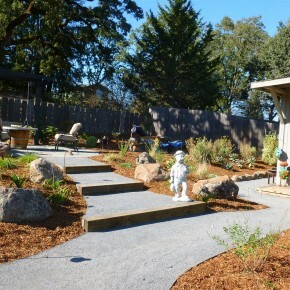 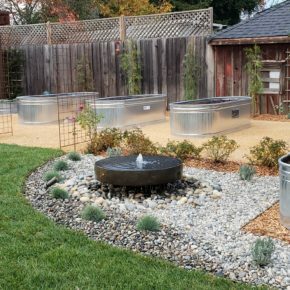 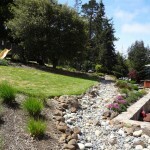 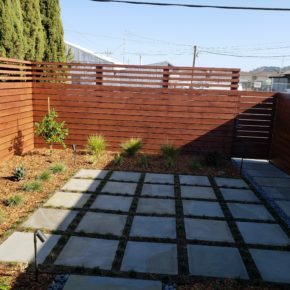 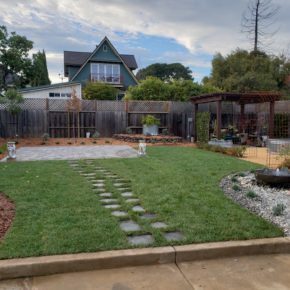 This front yard design and installation in San Rafael focused on creating a new low maintenance, low water use garden to replace an existing front lawn. 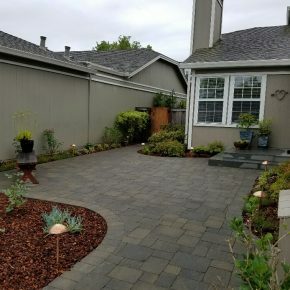 Because of the layout of the front entry for this project, a new paver patio was installed to create a courtyard space off the front entry path. 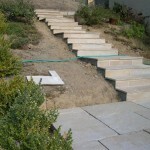 We used McNear pavers for the hardscape, accented with a Bluestone landing over an exisiting concrete stoop. 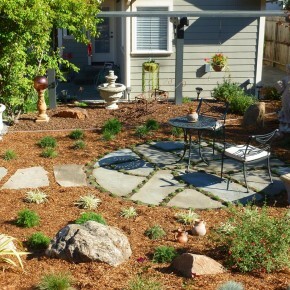 Plantings focused on creating color, texture and interest while being easy to care for. 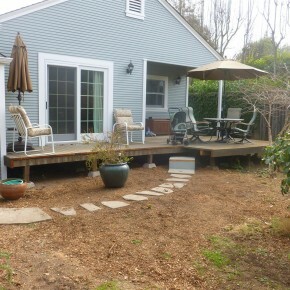 New LED lights highlight the path and new patio space. 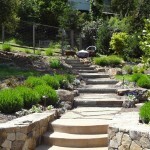 We highly recommend O’Connell Landscape. 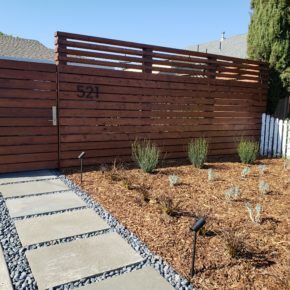 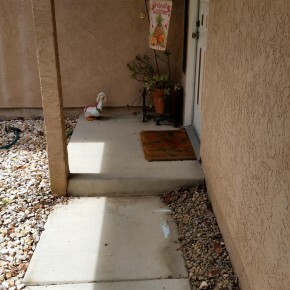 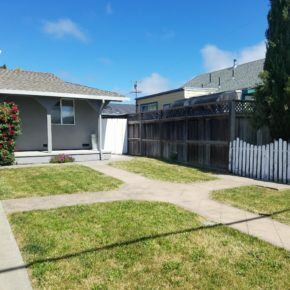 We are delighted with our new front yard which eliminated the dreaded lawn and replaced it with an easy care, drought tolerant, very attractive landscape. 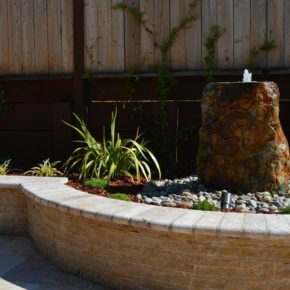 Michael provided a design that incorporated all the elements my husband and I wanted, and expert advice and infinite patience on all fronts: Hardscape, plants, lighting, irrigation and more. 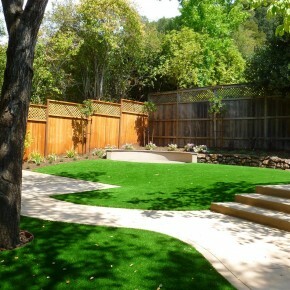 O’Connell Landscape has a very efficient and yet flexible mode of operation; deadlines and the budget were meet. 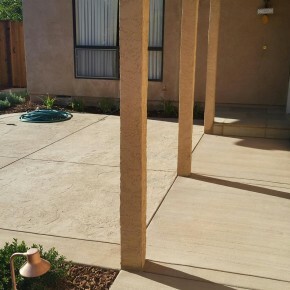 The crew is extremely hard working and highly skilled in all areas: Foundation work, paver fitting, soil preparation, woodwork and lighting installation. 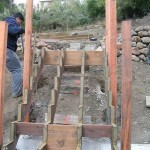 There was excellent communication between the crew and/or Michael and the client. 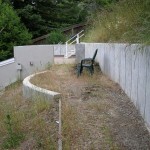 In our case, approval of the plan was required by a homeowner’s association. 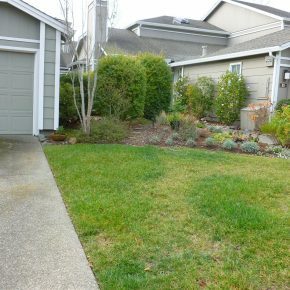 Michael provided the requisite documentation for this process; compliments were expressed by the HOA for the complete and professional plans. 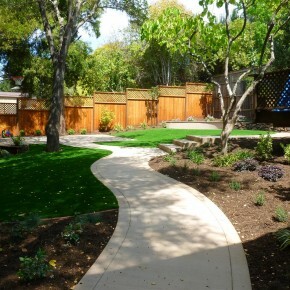 The overall care and attention that our project received from O’Connell Landscape was of the highest quality. 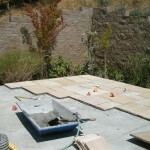 It was a lot of fun to work with this company. 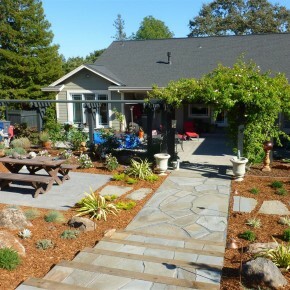 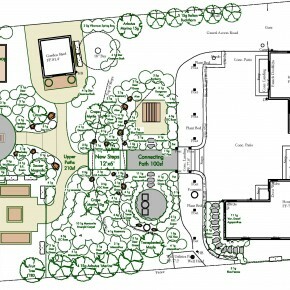 This front and back yard project in Cotati focused on new spaces around a recently constructed home. 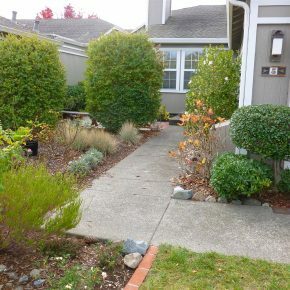 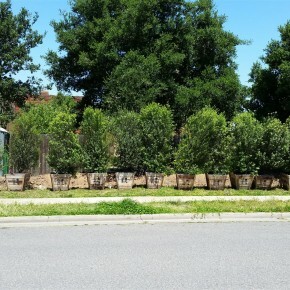 The front yard had some previous landscaping that was not cohesive and didn’t create a sense of entry or curb appeal. 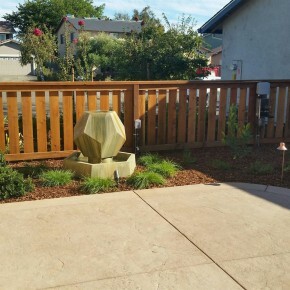 The back yard was a gentle slope with little existing landscape that needed a plan to best utilize the space. 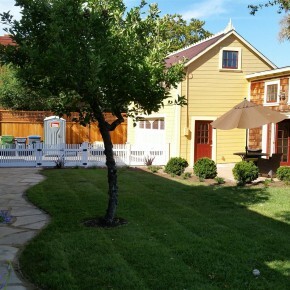 Our solution for the front yard was a split rail fence and new focus on an existing majestic Valley Oak. 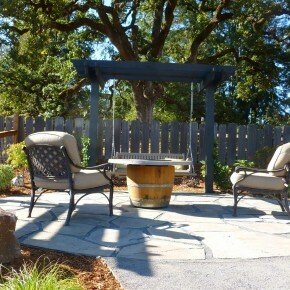 In the back yard a new series of spaces with seating areas, large garden area, and firepit with swing were highlights. 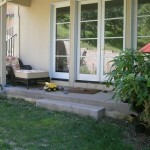 See before and after images and design drawings below. 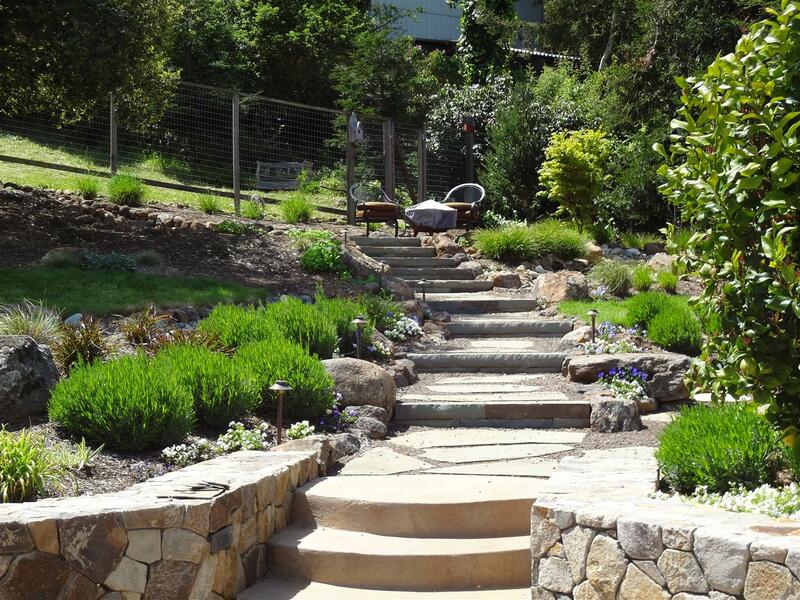 We are extremely pleased of what Michael O’Connell helped us achieve in our front, side and backyard. 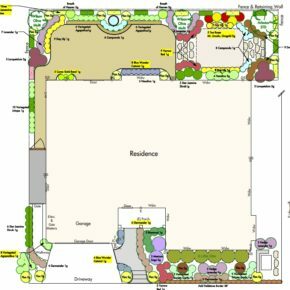 He listened to our ideas and with his, designed a wonderfully enclosed vegetable garden, which includes a greenhouse and water feature, planned out seating areas for our family and his placement of lighting is absolutely beautiful in the evenings. 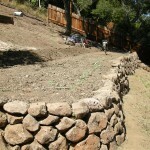 This was truly a team effort. 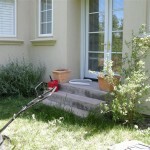 And we very much appreciate his staff of workers who were friendly and knowledgeable of all tasks asked of them. 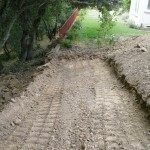 They stayed on track and cleaned up each day. 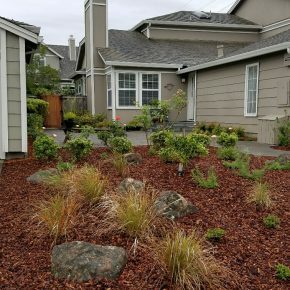 Great selection of drought tolerant plants were chosen with just the right blend and size that will produce color for year round enjoyment. 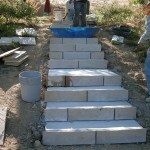 Thank you Michael for all your advice and making yourself available to answer our questions evenings and weekends. 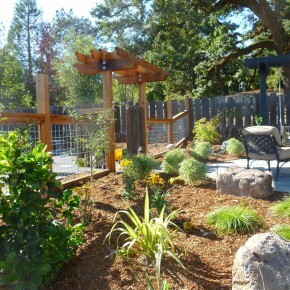 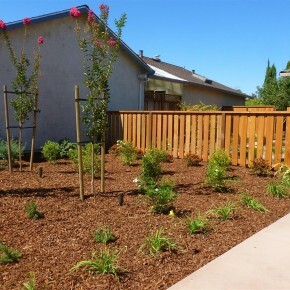 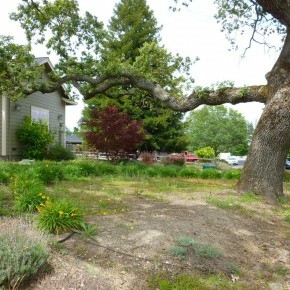 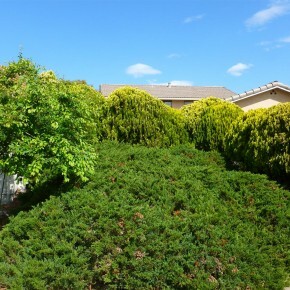 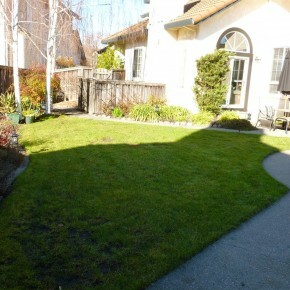 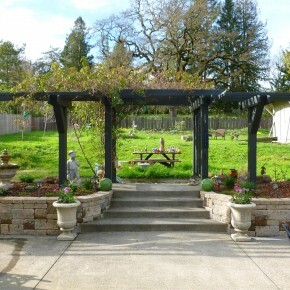 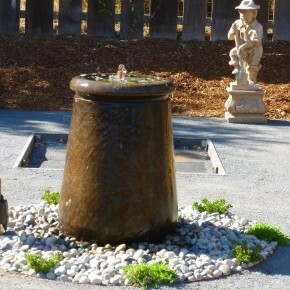 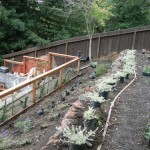 This project in Petaluma reinvented an older front yard that had been overgrown, junipers taking over the front yard. 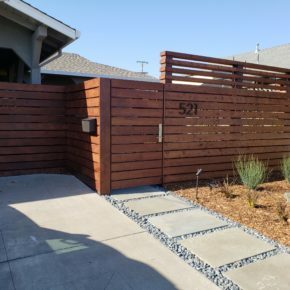 A new interior courtyard was installed with dividing fence connected with colored stamped concrete throughout. 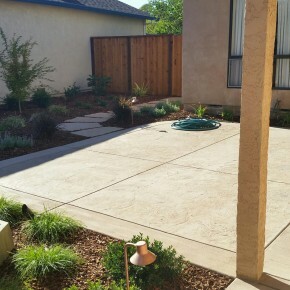 LED low voltage lighting and a front water feature complimented new plantings and accents of natural stone. 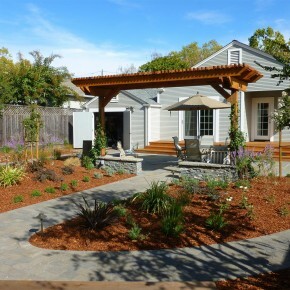 It was an absolute delight to work with Michael and his team. 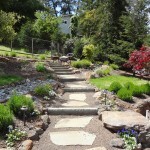 He was always available and very knowledgeable about all aspects of landscaping our front yard. 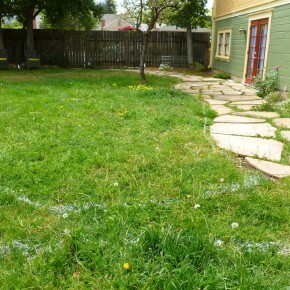 Deadlines were always met and the workers were always on time and left everything neat when they left for the day. 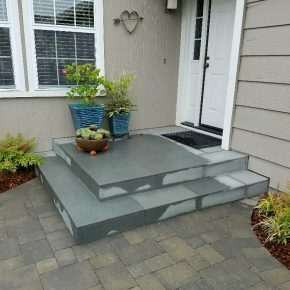 The price was always broken down so I knew what each item cost. 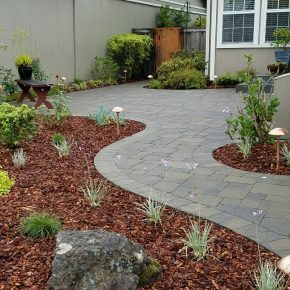 I would highly recommend O’Connell Landscape and Michael to anyone. 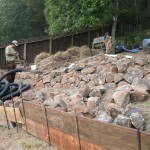 Michael made the job seem so easy and effortless and he followed up after the job was completed to make sure everything was working correctly. 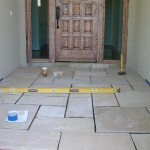 I only wish all contractors were as friendly and as easy to get along with as Michael. 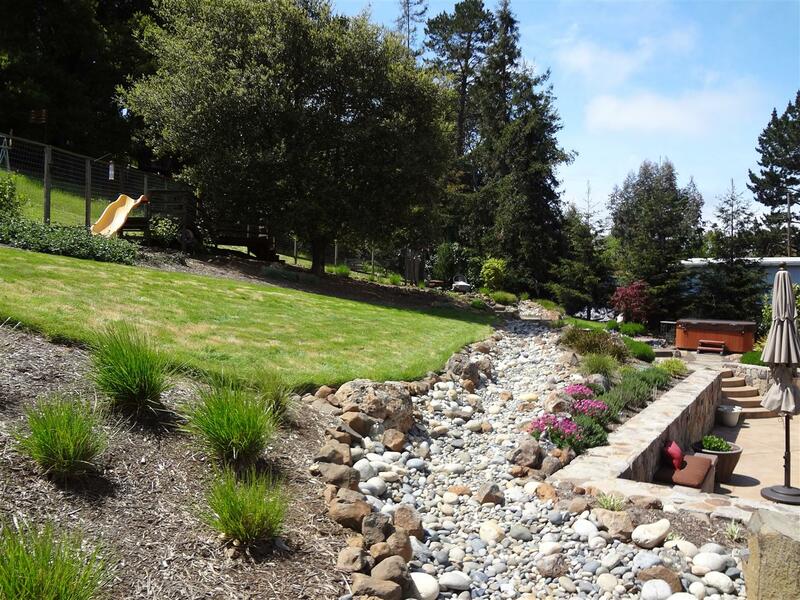 The landscape design and installation for this distinctive Victorian in West Petaluma was focused on improving the usability of a large 1/4 acre corner lot. 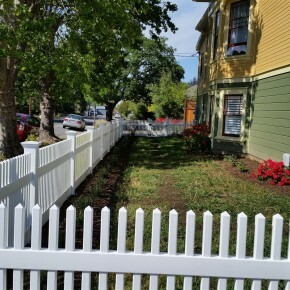 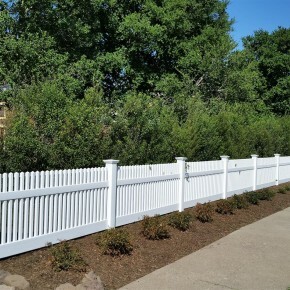 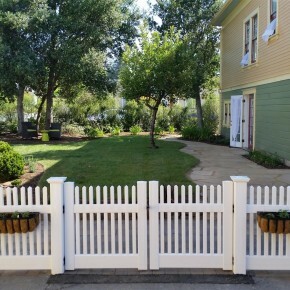 – New exterior picket fencing to reclaim the front yard spaces, while fitting in with the neighborhood. 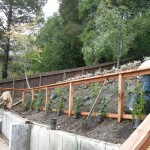 – At the side yard a large hedge of mature 24″ box Pittosporum shrubs was used as screening to expand the back yard space. 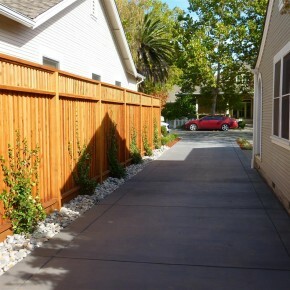 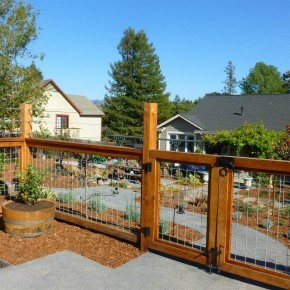 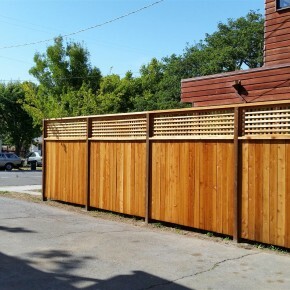 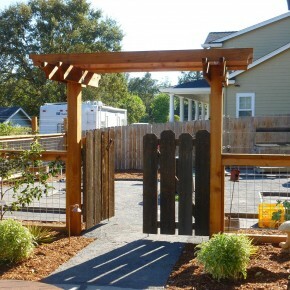 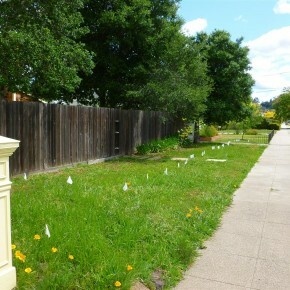 -New redwood fencing was installed at the neighbors to provide for greater privacy. 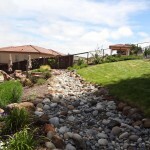 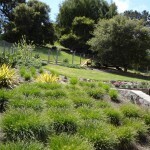 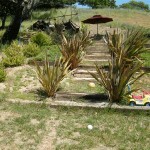 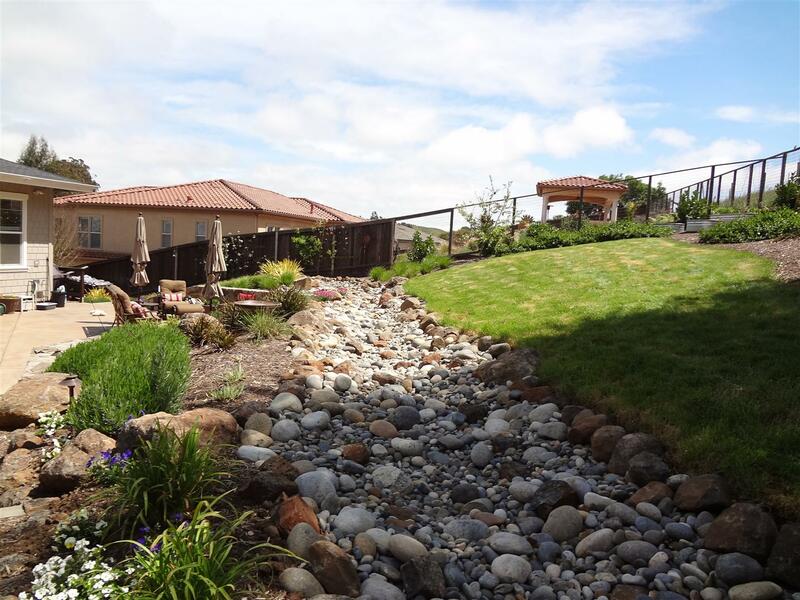 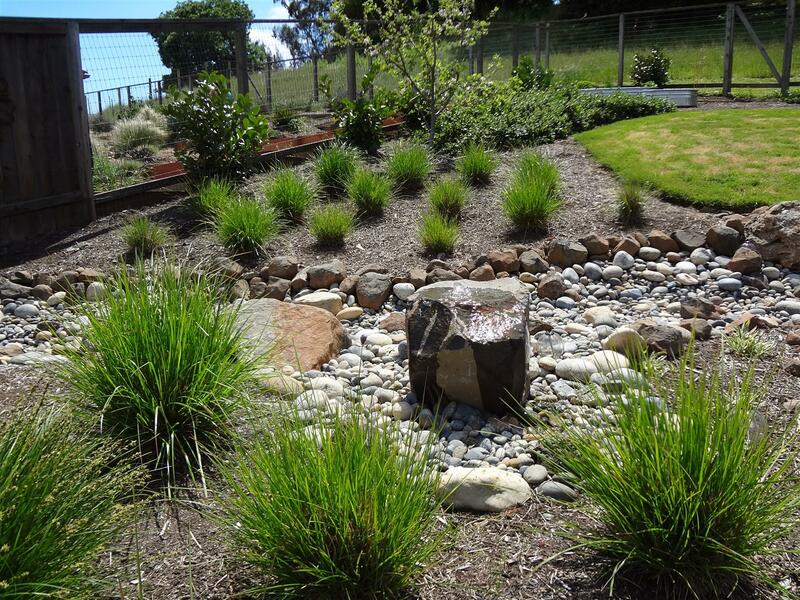 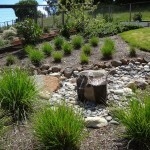 -The landscape was integrated with a new irrigation system with laundry to landscape greywater system. 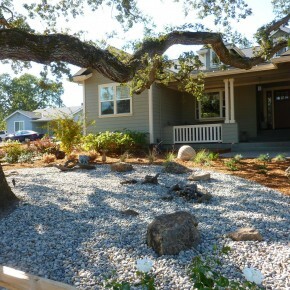 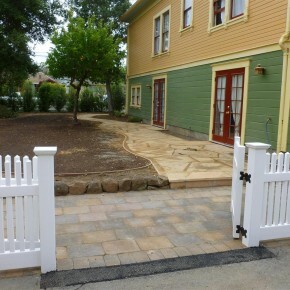 We absolutely loved working with Michael and his team on landscaping for our new home in Petaluma. 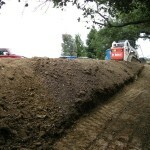 Everyone of the team was very professional. 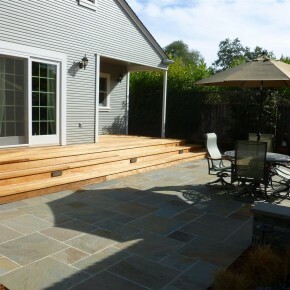 Michael paid attention to all the details of design, budgets, contracts, schedules and overall customer service. 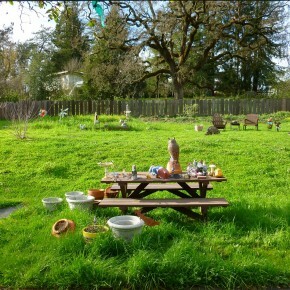 All budgeted items and schedules were met. 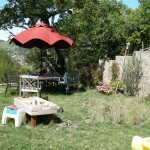 He was responsive to our questions nights and weekends and followed up on everything. 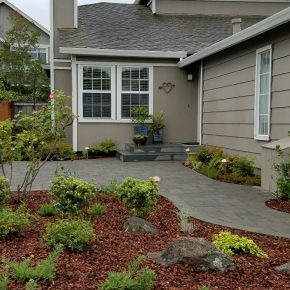 We highly recommend them. 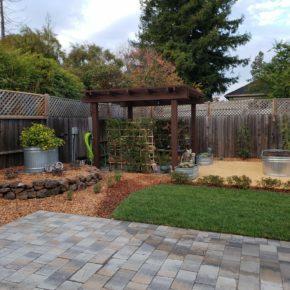 This project in Sonoma was a complete make over of a front and back yard for a residence a few blocks from the Sonoma Square. 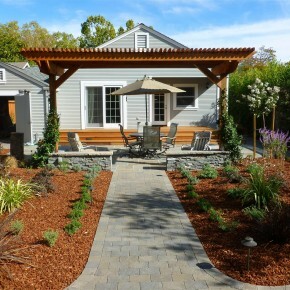 The design focused on the back yard, with a new patio, seat wall and shade arbor framing paver garden paths. 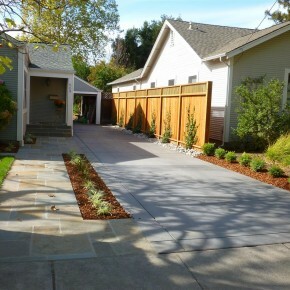 In the front yard a new matching bluestone walkway, concrete driveway, and privacy fence changed the look of the home from the street. 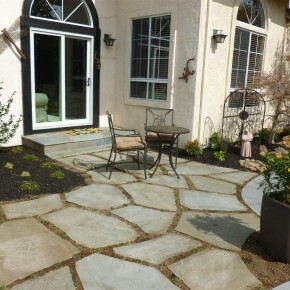 O’Connell Landscape just completed a landscape project for our front and back yards. 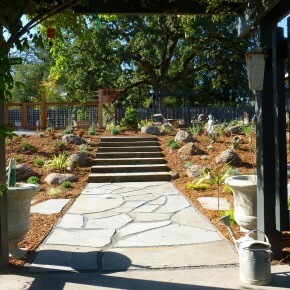 The design, quality of workmanship, plant selection and his crew exceeded our expectations. 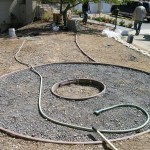 His attention to detail is reflected in how his crew approached each phase of our landscape project. 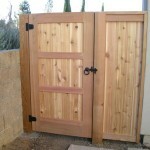 Michael provided us with a detailed design, options for different materials and the cost. 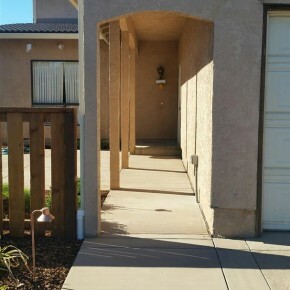 When we made a few changes/additions to the original design, he provided us with a signed Change Order before any additional work was started so there were no “surprises” at the end. 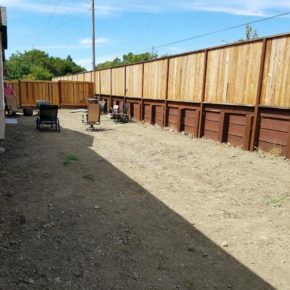 He was available to answer all our questions and concerns and provided us with knowledgeable guidance from the day he gave us our complimentary consultation to the day of completion. 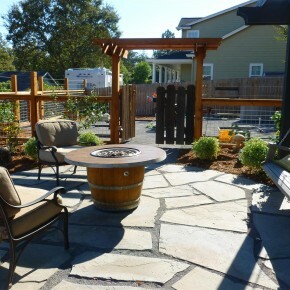 We are extremely pleased with the outcome and enjoy sitting out in our new backyard. 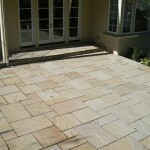 It was a pleasure working with Michael and his crew. 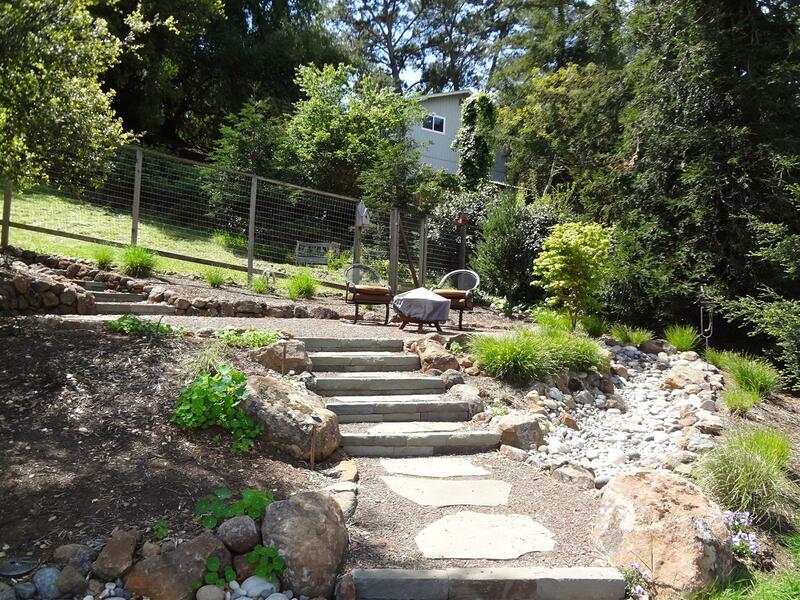 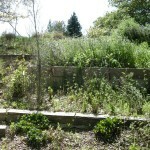 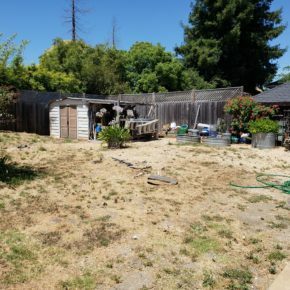 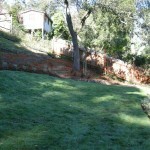 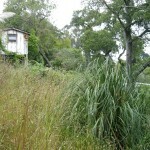 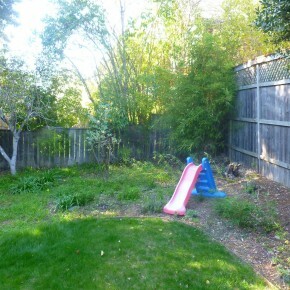 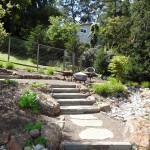 We started from scratch on this Kentfield back yard, with a complete removal of the unusable existing yard. 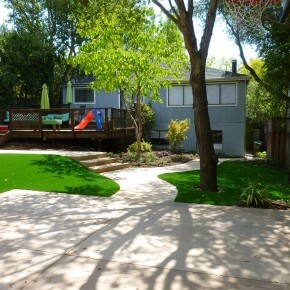 The client wanted a back yard that would be a kid friendly play space, while at the same time good for entertaining. 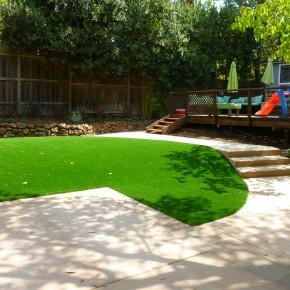 In its place we installed a new patio area, kid friendly synthetic turf and a new seating area. 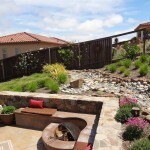 These elements were tied together with integrated perimeter plantings. 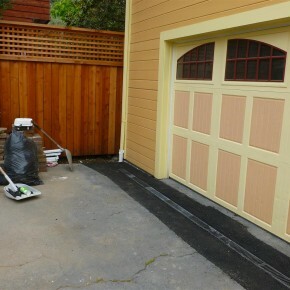 See below for the before picture and after photos following installation. 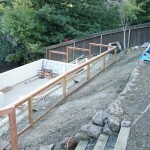 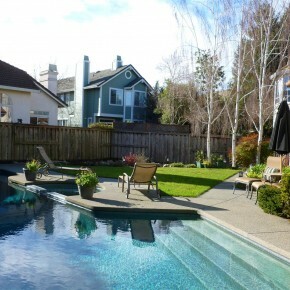 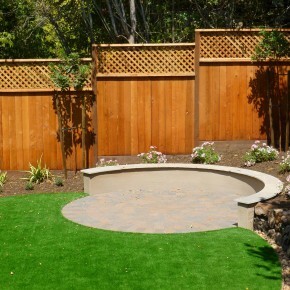 We are working on finishing up this project in Petaluma, a re-landscaping of a back yard and pool deck. 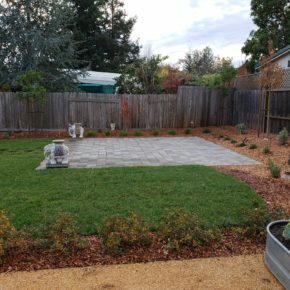 The old layout was not very usable with a small lawn; the design incorporated a new dry laid bluestone patio, fencing and gate upgrades, new plantings, and a resurfacing of an older cracking concrete pool deck. 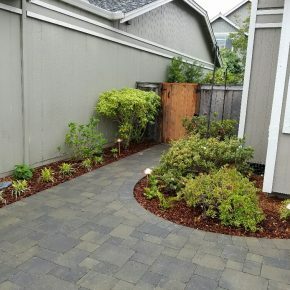 One of the great things about working on residential landscape construction projects is it gives us the opportunity to work closely with homeowners to transform the yards and outdoor spaces. 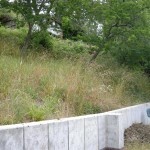 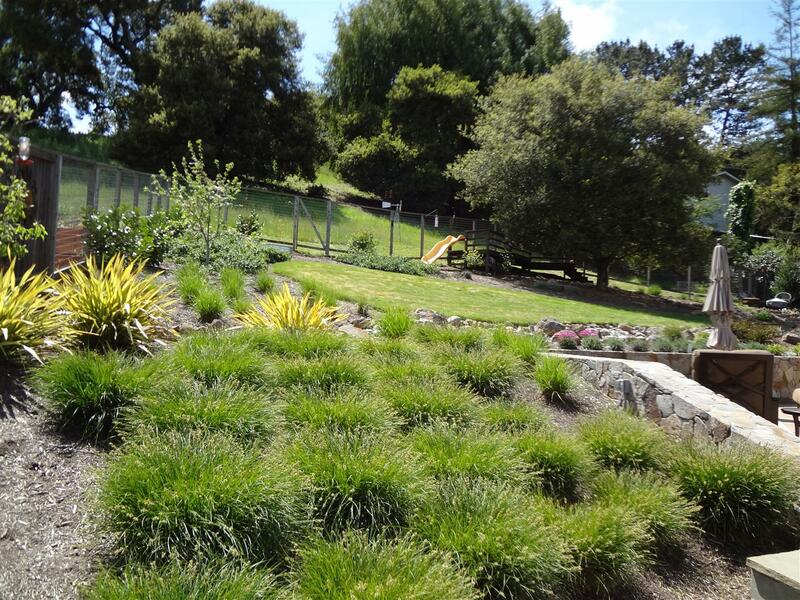 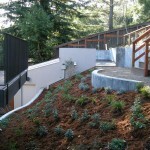 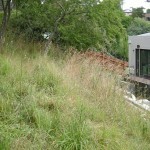 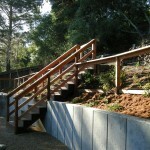 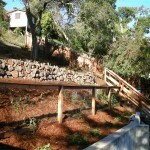 We just wrapped a hillside project installation in Mill Valley. 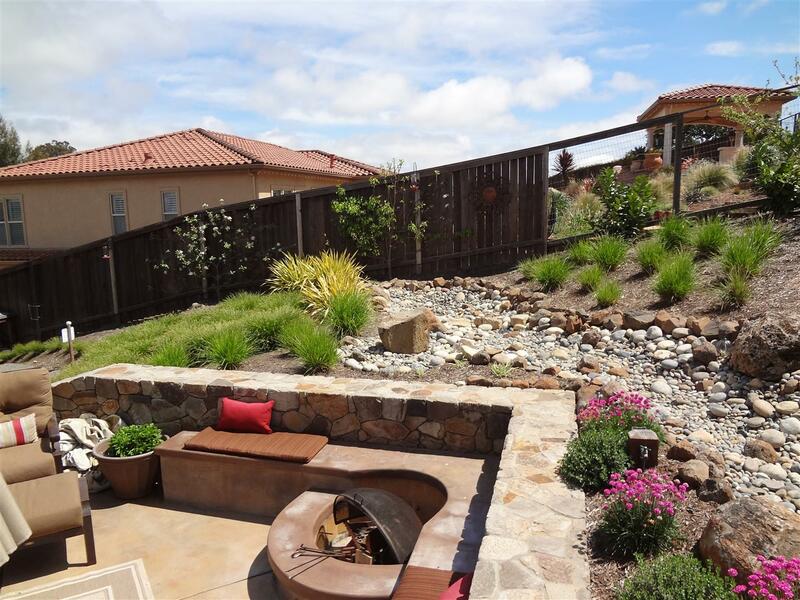 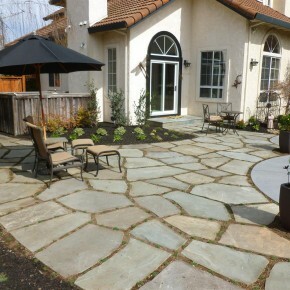 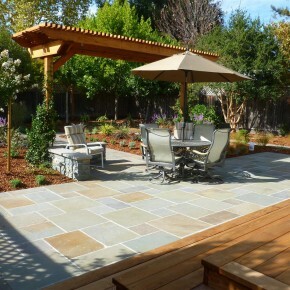 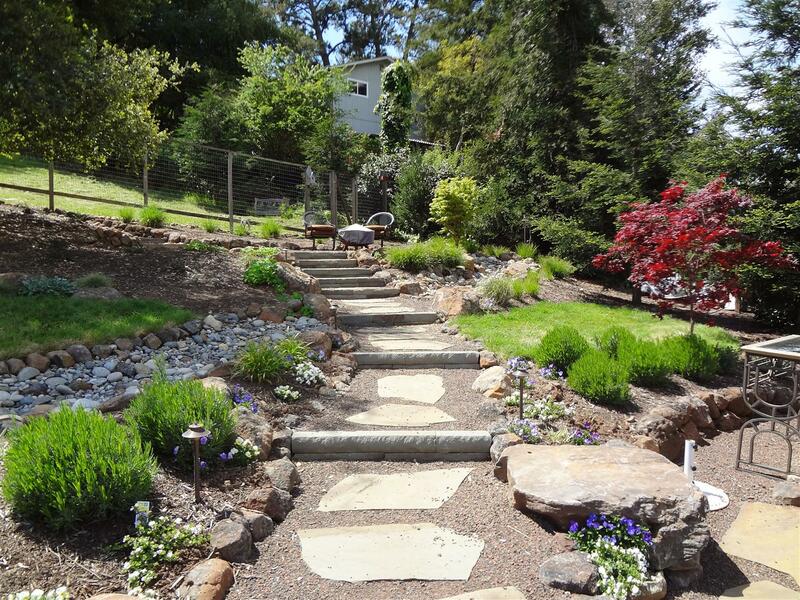 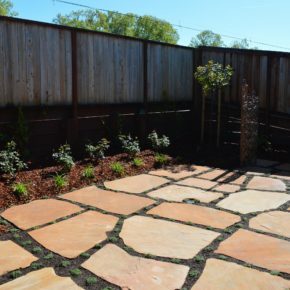 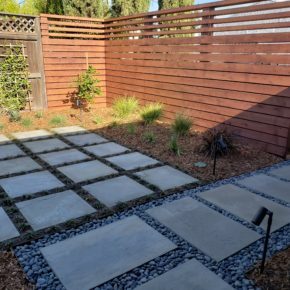 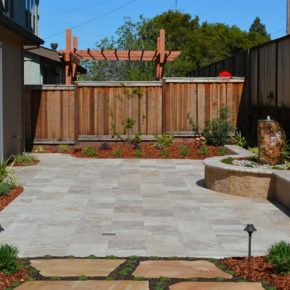 This project in Novato was a multi-phase project that grew from an initial focus on one section of the yard, to a comprehensive new grouping of flagstone patios, steps, and plantings. 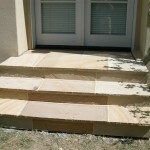 We used a Dusty Way Indian Sandstone to tie together the front entry, side landings and steps, and a large rear patio. 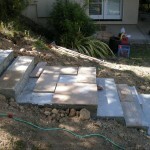 Concrete has been installed. 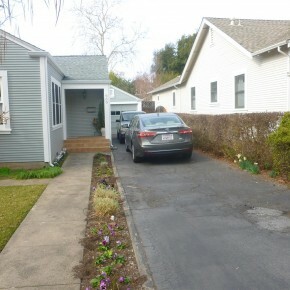 This photo was taking right after installation. 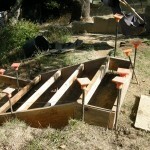 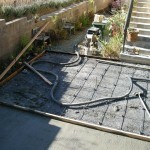 The concrete will dry to a closer match to the existing concrete. 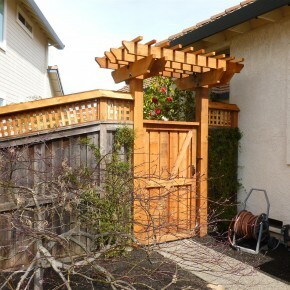 The result is a much more open and usable space. 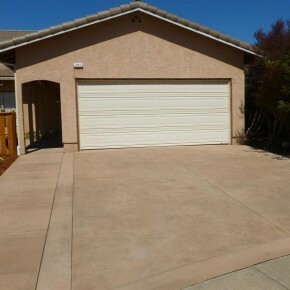 Concrete has been exposed with an acid wash and pressure wash and the concrete has had a chance to dry. 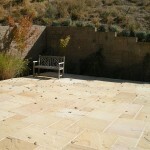 The result is a close match to the existing patio.